3 How do I play? 4 How do I create? Gametable is our tabletop testbed and game community, powered by Tabloro. It allows users to create games and play them together on a virtual tabletop emulator. We're currently using Gametable to feature the Erfworld deck of playing cards that are being funded on Kickstarter until January 7, 2017. The top stretch goals for the Kickstarter project will contribute to continued development for Gametable. The first step is to develop the system to fix bugs, make improvements, and introduce features that will allow for a smoother gameplay experience. This includes things like better control of a player's hand, a natural way to determine player positioning at a table, and dealing cards. Once it's possible to reliably create and play the sorts of games we envision hosting, we plan to expand the social tools to make Gametable an environment for people to develop, playtest, and get feedback on their own game ideas. 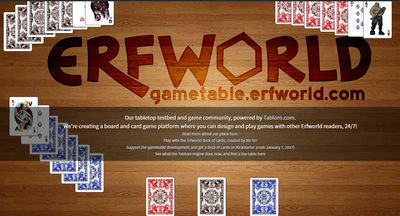 The Gametable could eventually be the framework for an Erfworld game. You can preview the Erfworld deck of playing cards by yourself, join a friend's table, or create a new table. Once a table is loaded, you can click and drag single cards around or select multiple cards with a rectangle. Selected cards will have icons at the top left with options like flipping a card, taking to your hand (at the bottom left of the window), stacking multiple cards, or shuffling. Other piece types you might see might have other options, like clicking to roll dice, locking a board piece in place, rotating a piece, or claiming a stash piece. From the Menu at the top right, you can create game pieces, boxes, and setups. Boxes contain pieces; setups associate with a box; tables are created from a setup. Most of the creation form is self explanatory, but here are some pointers. To create a deck of cards: use an image with all of the cards in one file, starting with the back of the card. Enable "Take to Hand", and use the "Cards / Sprite Sheet" type. Enter the width and height of the cards, and how many are in the image (including the back). Set "Flipable" to yes. To create a dice: use an image with all of the die faces in one file. You can use transparency to shape the die, but the frames will need to be a consistent width and height. Use the "Cards / Sprite Sheet" type. Set "Is Dice" to yes. To create a stash: Use a two frame image where the first frame is opaque and the second frame is transparent. Use the "Cards / Sprite Sheet" type. Set "Is Stash" to yes. After naming and creating a box, you'll add pieces to the box. For card decks, be sure to click the blue "Change number of pieces" button and set the back of the card to 0 to avoid having an extra back-only card in your box. You can also set multiples of certain pieces. Pay attention also to the layers at the right of the piece preview on the box form, to set pieces that should sit on top of other pieces appropriately. A setup is created from a box, which will define which pieces are available for that setup. After naming and creating the setup, click "Position Game Tiles" to set the initial table layout for your game, and "Save Layout" on the setup table to save your layout. This page was last edited on 29 December 2016, at 02:12.